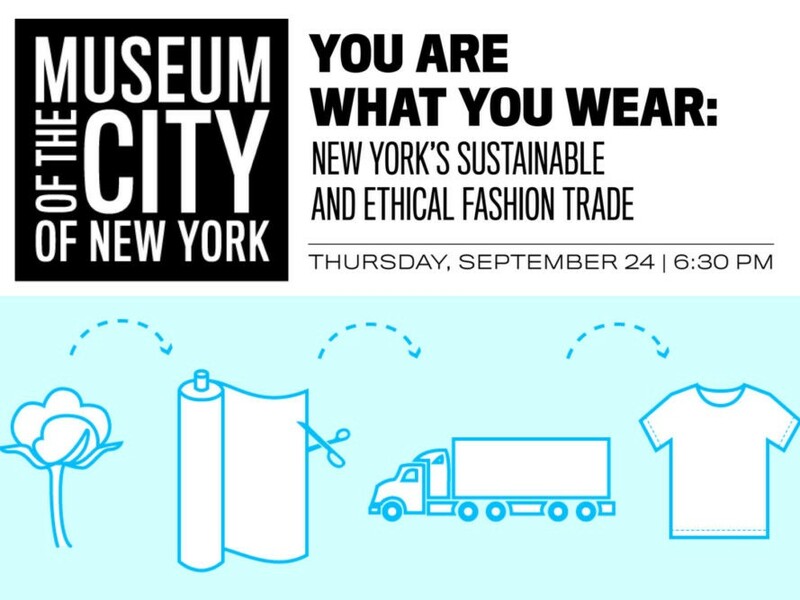 Join Ecouterre and the Museum of the City New York on Thursday evening, September 24, for a spirited discussion about sustainable and ethical fashion in New York City. Yours truly will be moderating a distinguished panel comprising Timo Rissanen, assistant professor of fashion design and sustainability at Parsons The New School for Design; Tara St. James of Study NY and Pratt Institute’s Brooklyn Fashion + Design Accelerator; and award-winning designer Yeohlee Teng. Tickets are free for museum members, $12 for students and seniors, and $16 for members of the general public. You can also get an early-bird rate of $10 if you reserve your seat online with the code FASHION15. While the value of what we put in our bodies is by now common knowledge, the awareness of what we put on them is still growing. But many designers and consumers are increasingly committed to responsibly produced clothing that is made locally, treats workers fairly, and minimizes damage to the environment. As the epicenter of the nation’s garment industry past and present, New York City is at the forefront of the sustainable fashion movement. Join designers, shop owners, and others in the style world to discuss the obstacles and opportunities that face the movement to create ethically made and fashion-forward clothing. Part of the Museum of the City of New York’s Activist New York program series, the event is made possible by the Puffin Foundation and is co-sponsored Black Dress, the Brooklyn Fashion + Design Accelerator, the the BMCC Center for Career Development, Drakeford PR, Ecouterre, the Fashion Institute of Design & Merchandising, Garment District Alliance, Helpsy, the High School of Fashion Industries, Humans Who Design, Made in NY: Fashion, Manufacture New York, The GreenShows, and Zady. 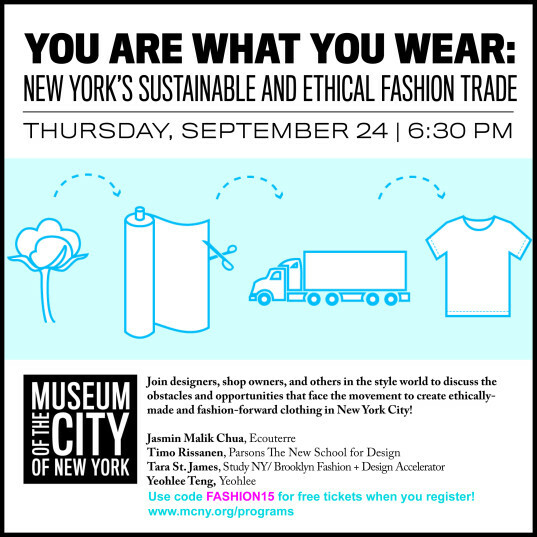 Join Ecouterre and the Museum of the City New York on Thursday evening, September 24, for a spirited discussion about sustainable and ethical fashion in New York City. Yours truly will be moderating a distinguished panel comprising Timo Rissanen, assistant professor of fashion design and sustainability at Parsons The New School for Design; Tara St. James of Study NY and Pratt Institute's Brooklyn Fashion + Design Accelerator; and award-winning designer Yeohlee Teng. Tickets are free for museum members, $12 for students and seniors, and $16 for members of the general public. You can also get an early-bird rate of $10 if you reserve your seat online with the code FASHION15.